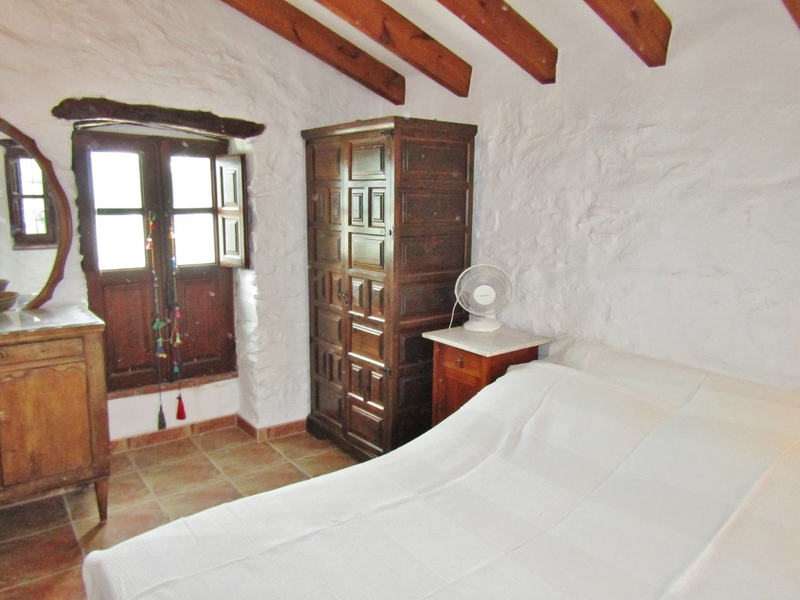 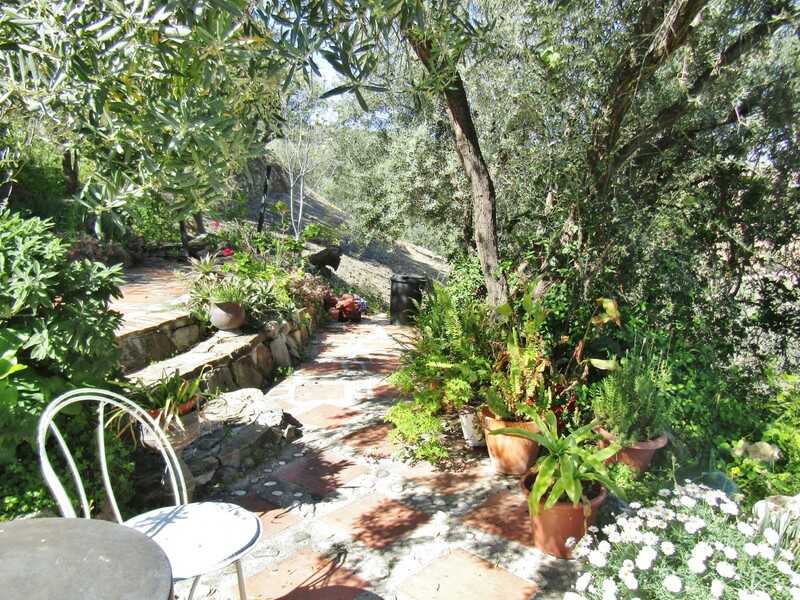 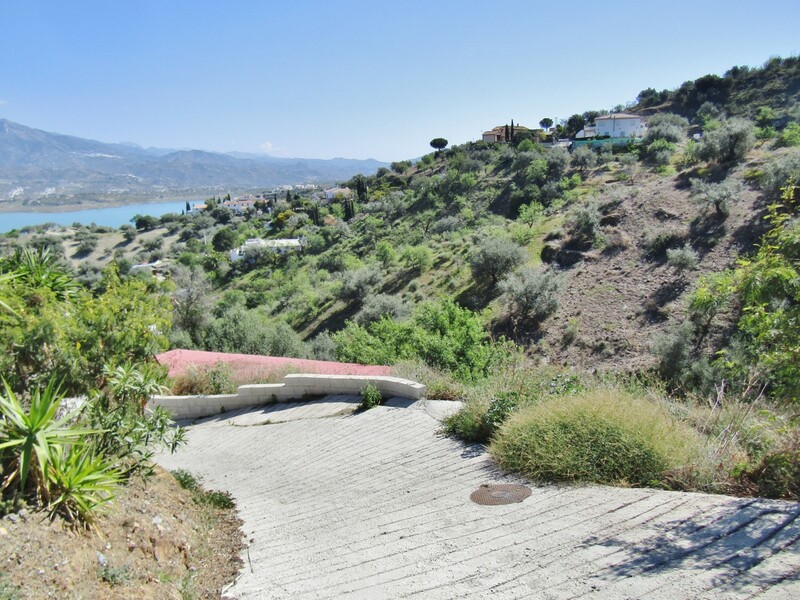 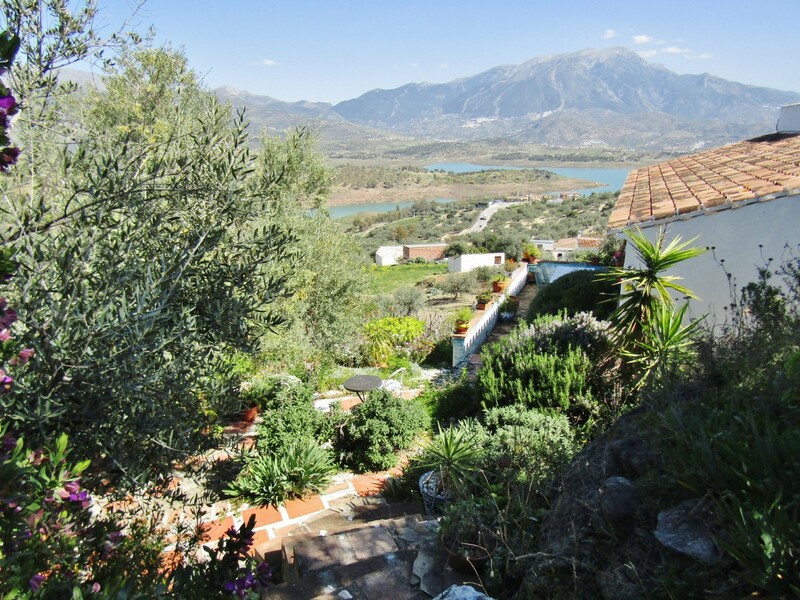 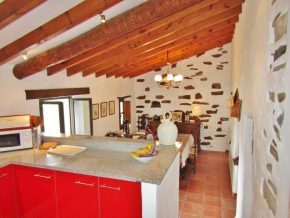 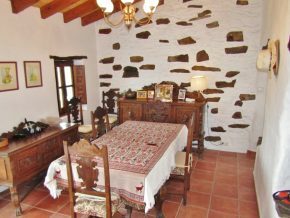 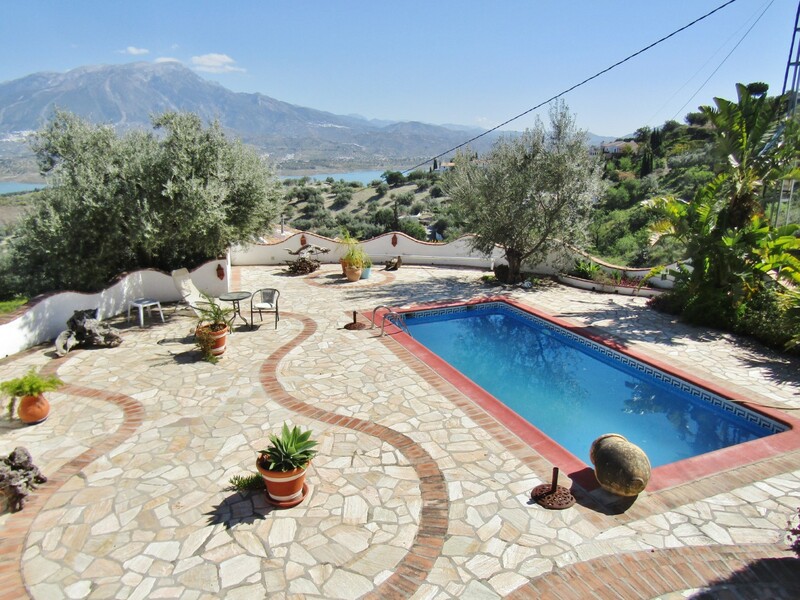 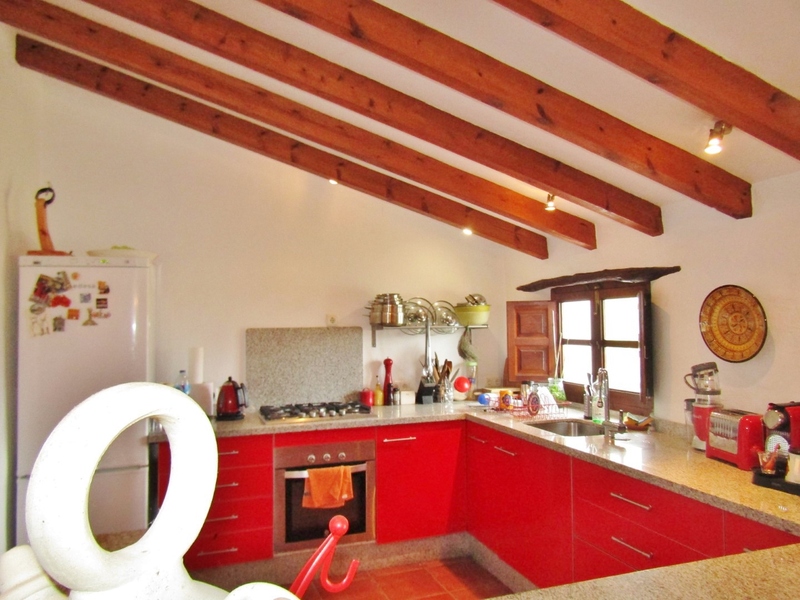 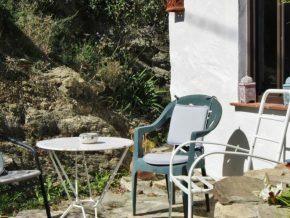 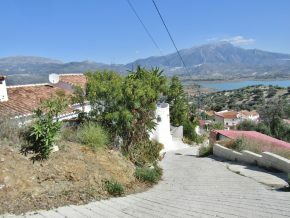 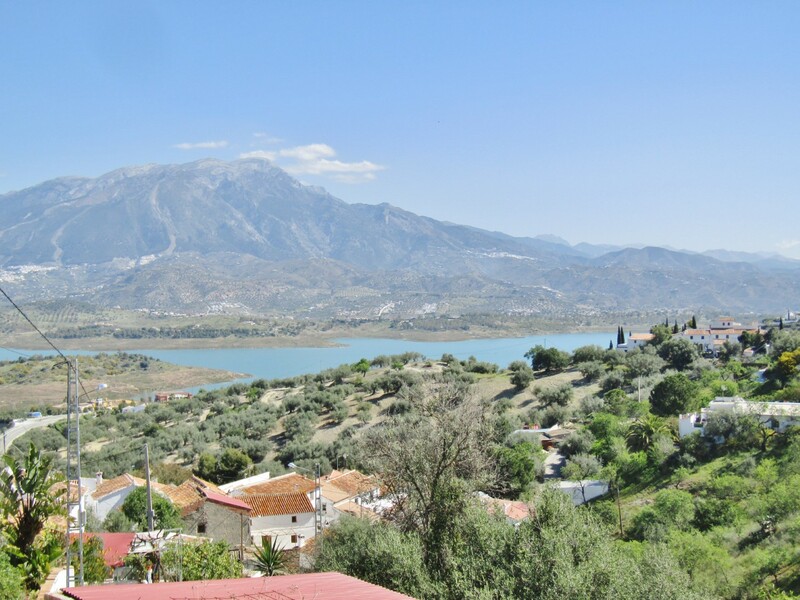 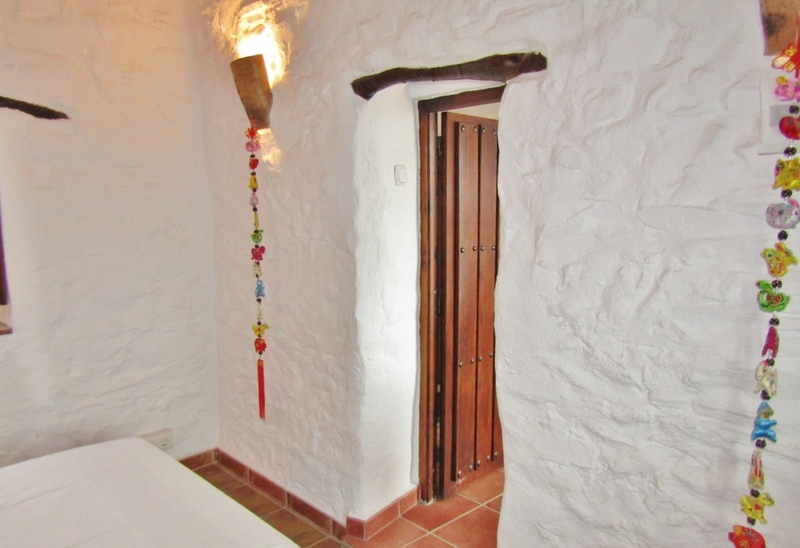 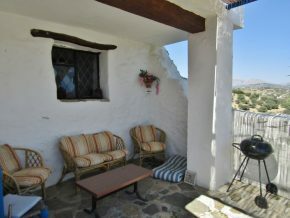 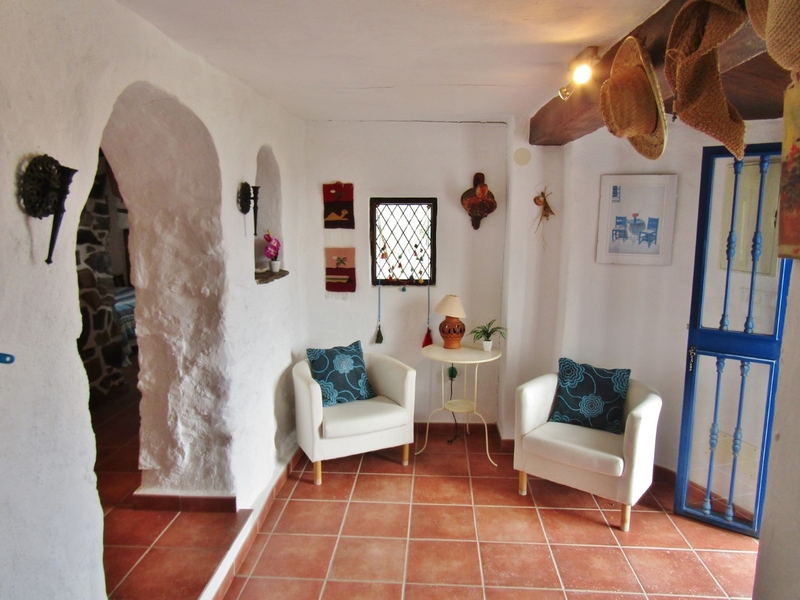 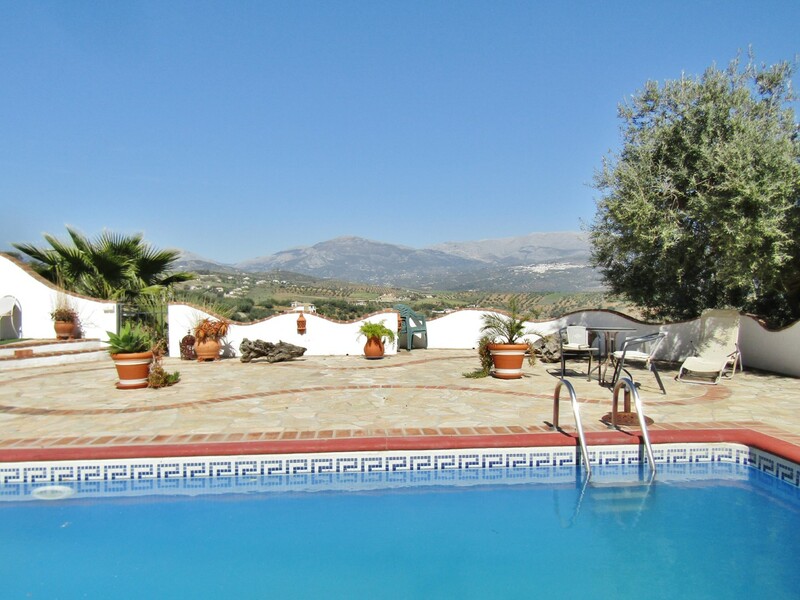 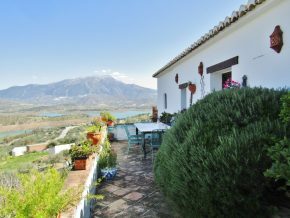 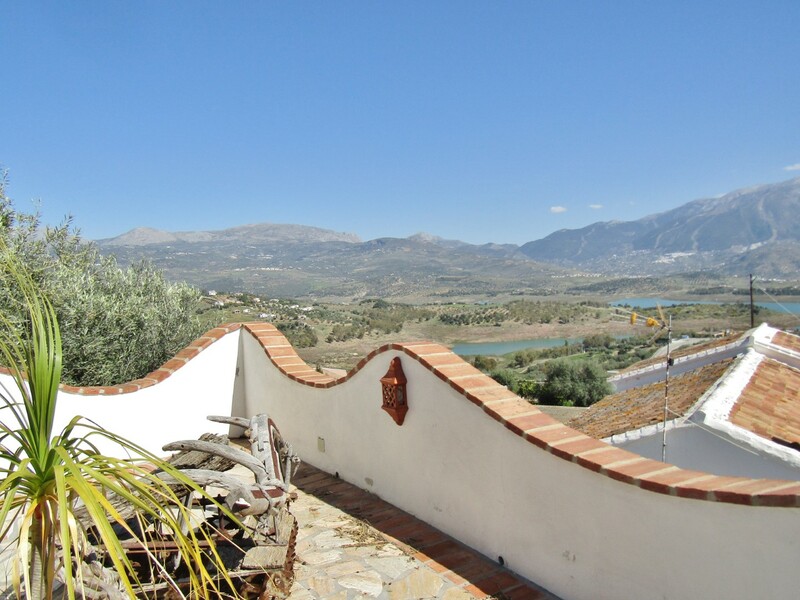 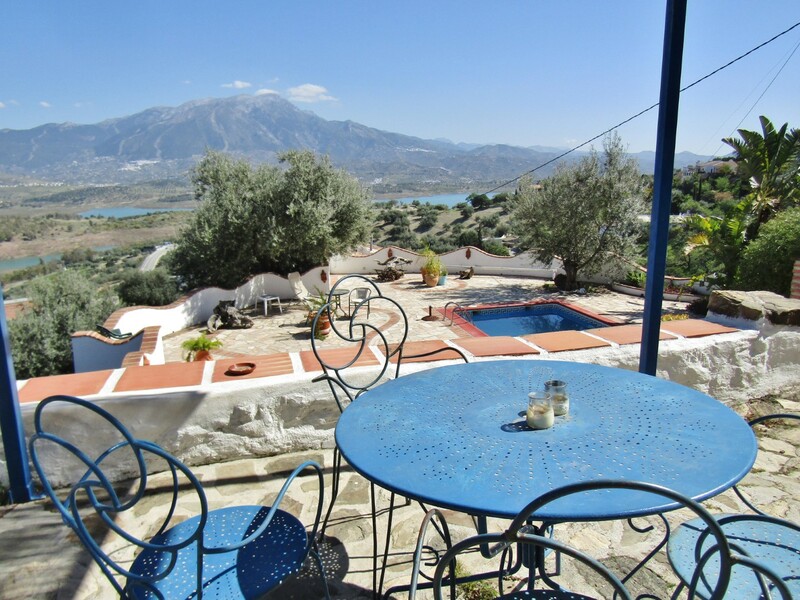 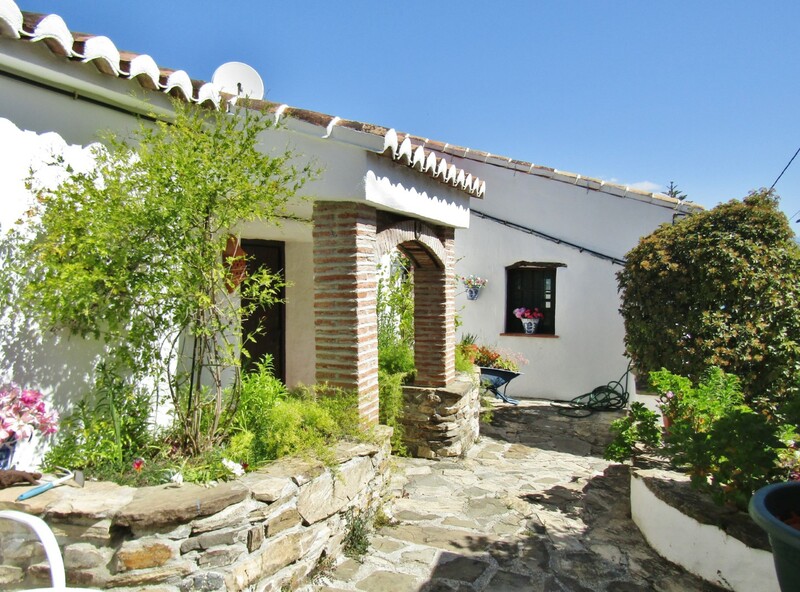 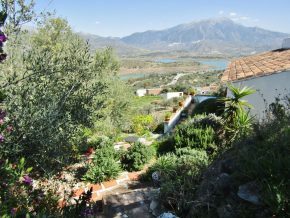 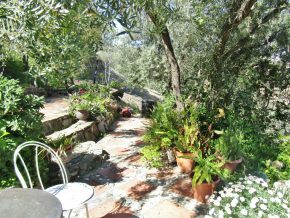 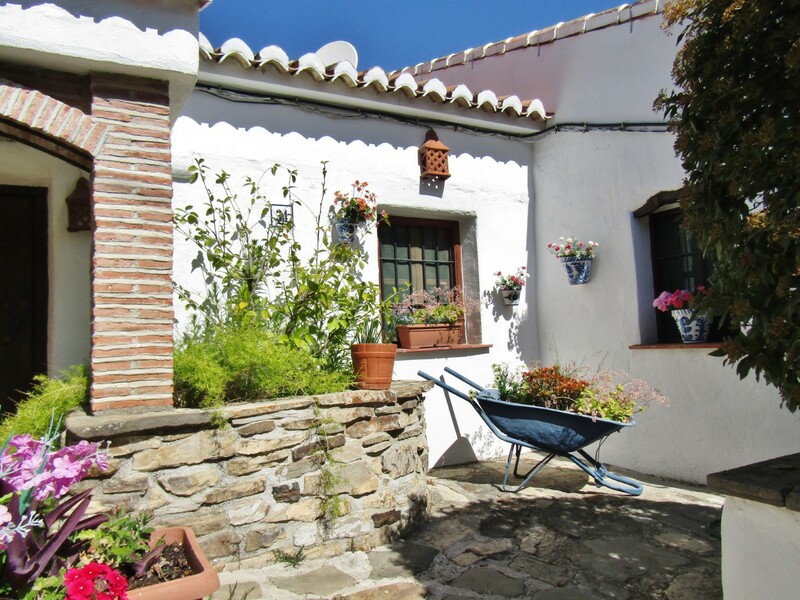 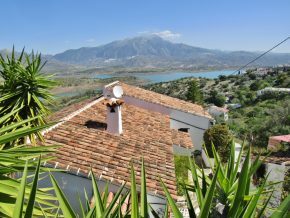 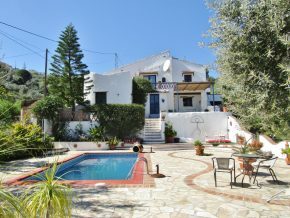 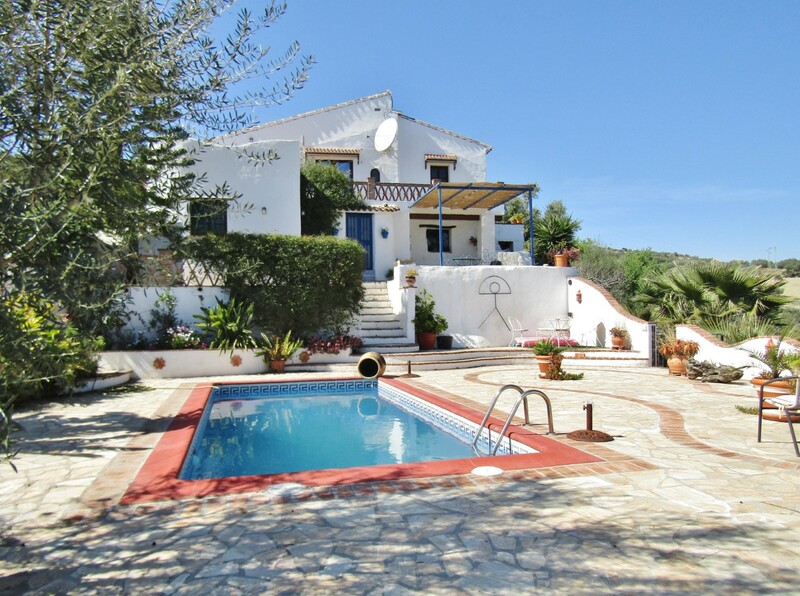 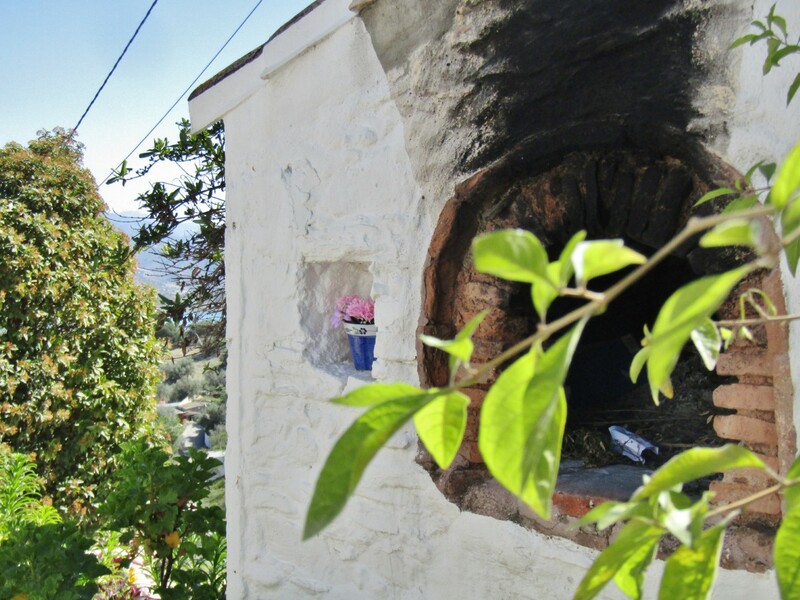 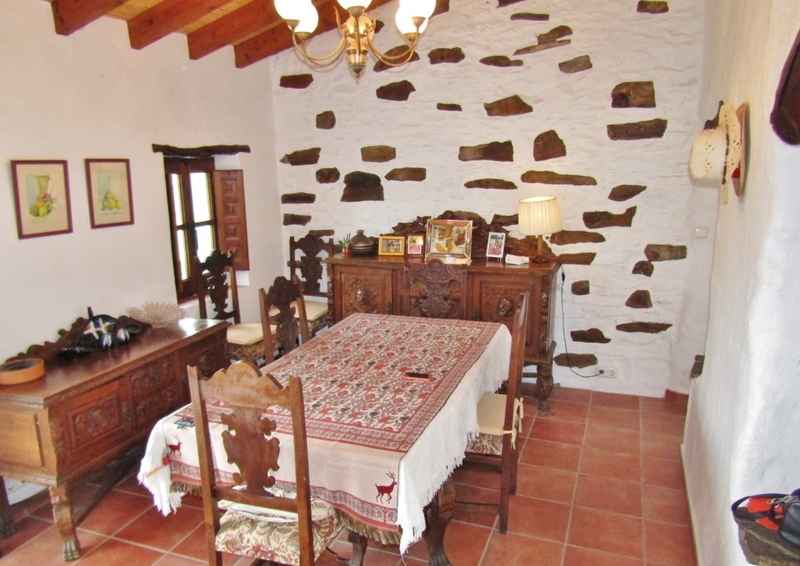 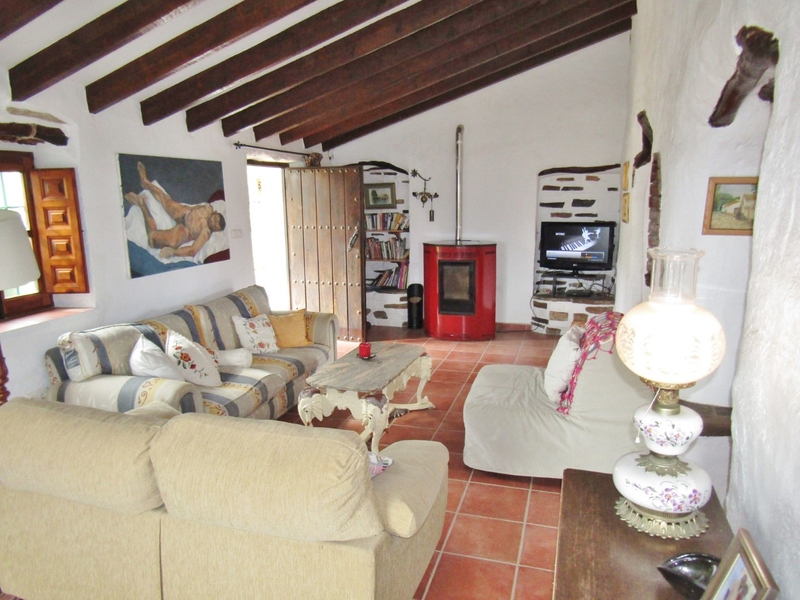 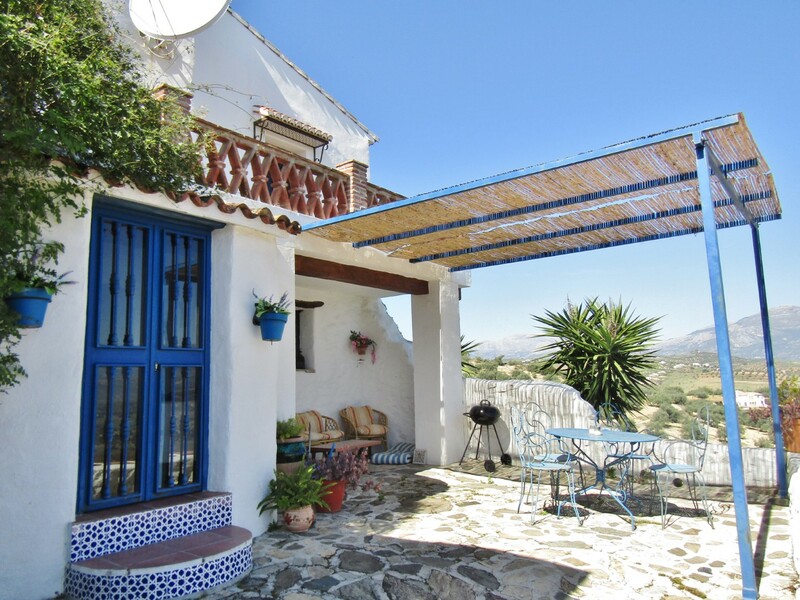 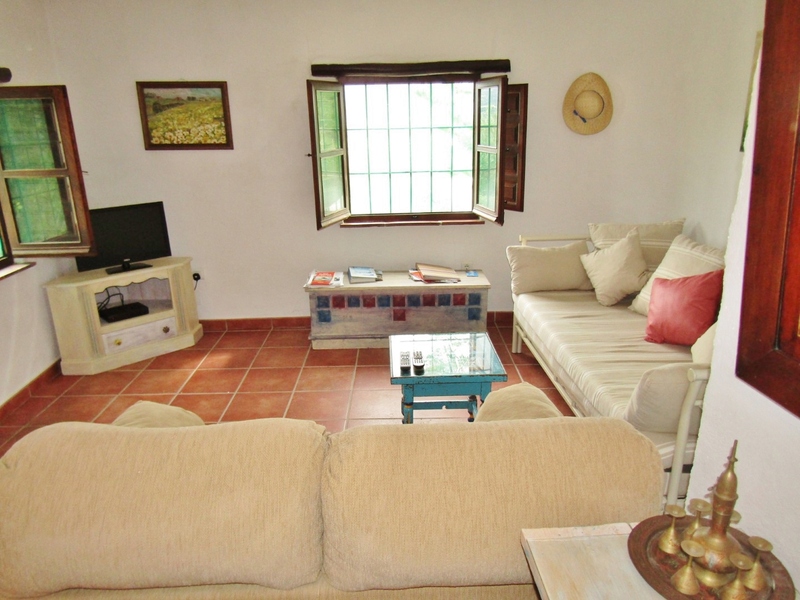 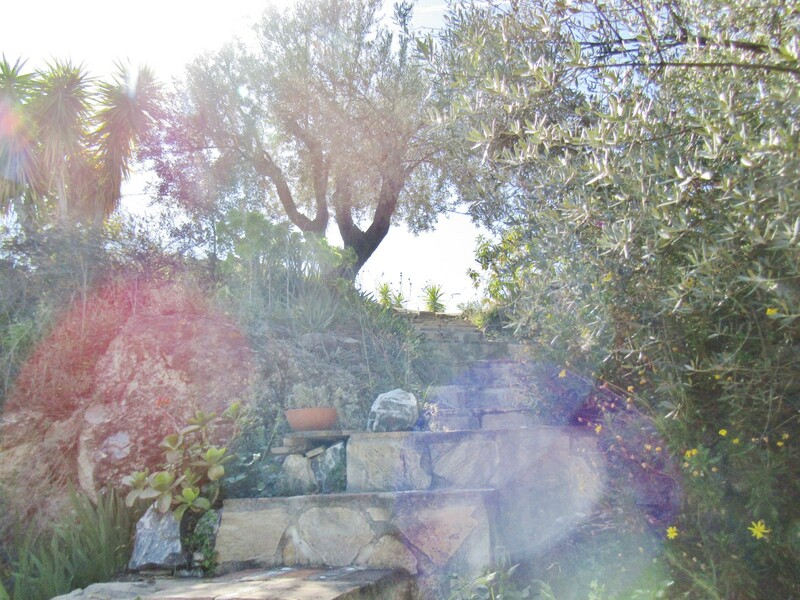 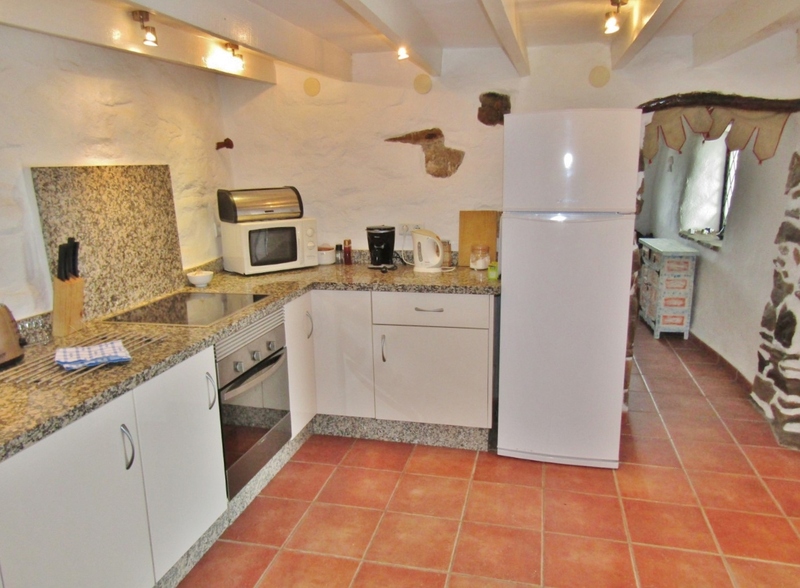 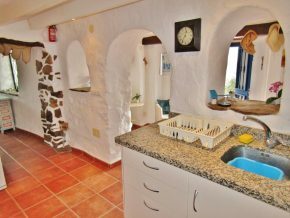 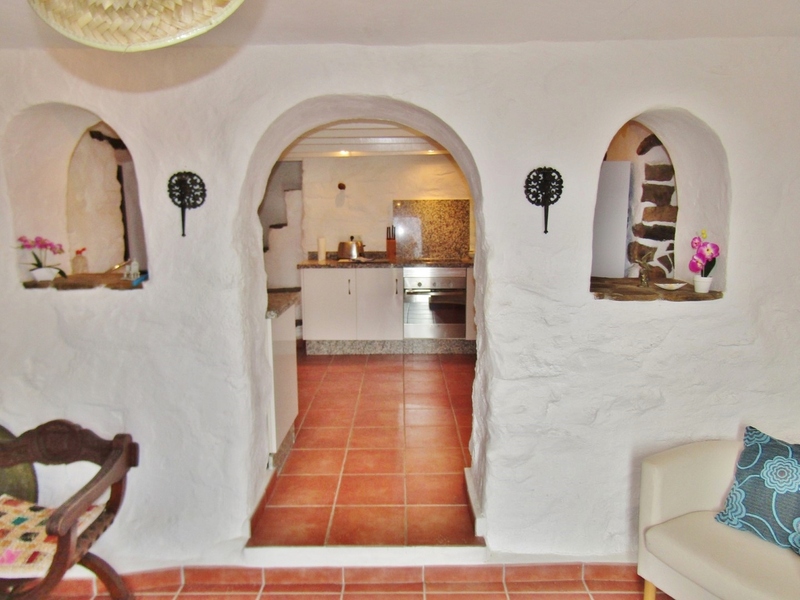 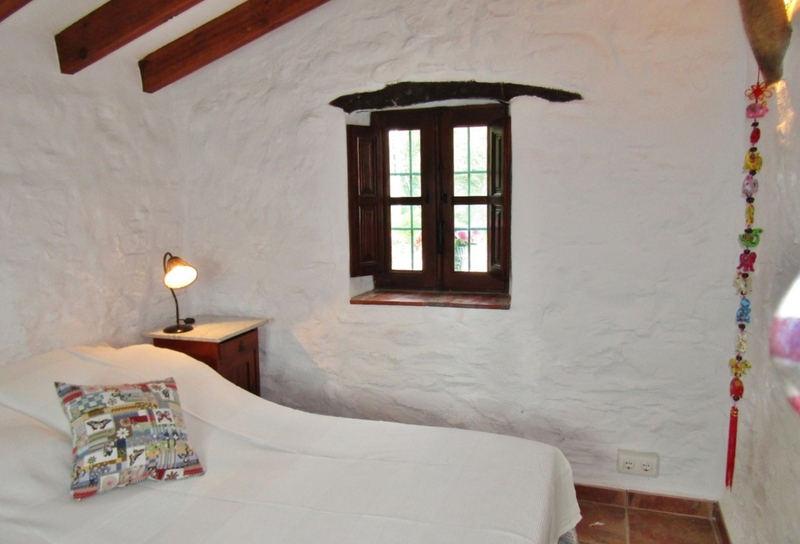 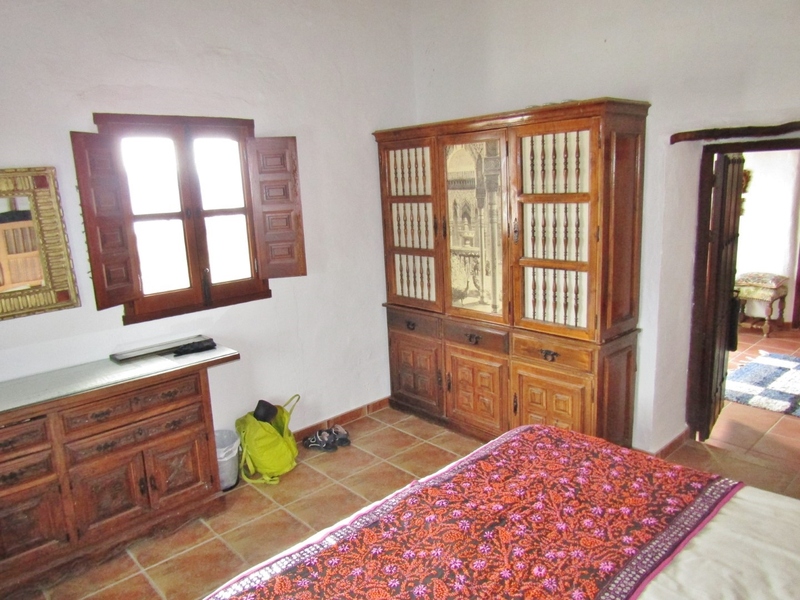 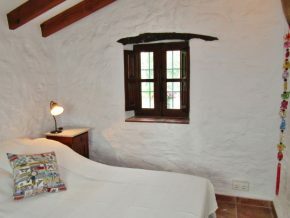 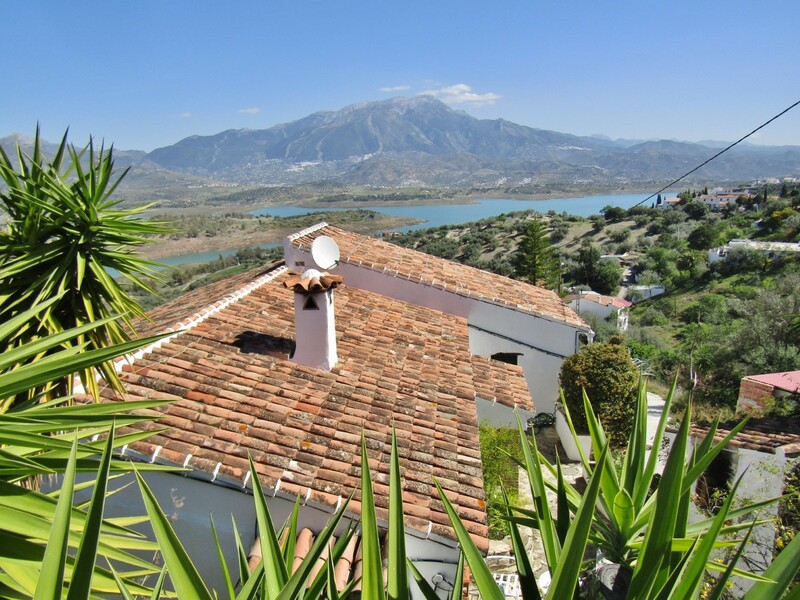 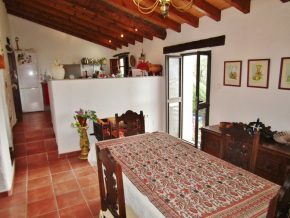 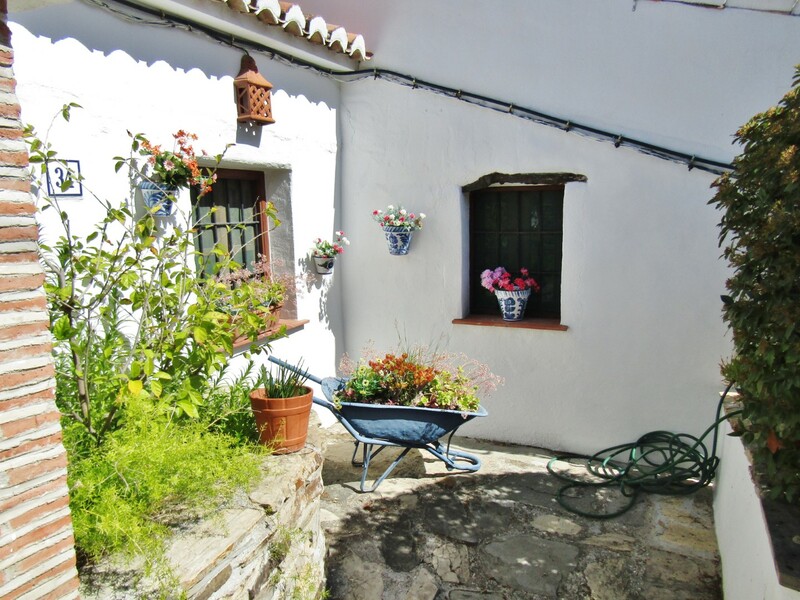 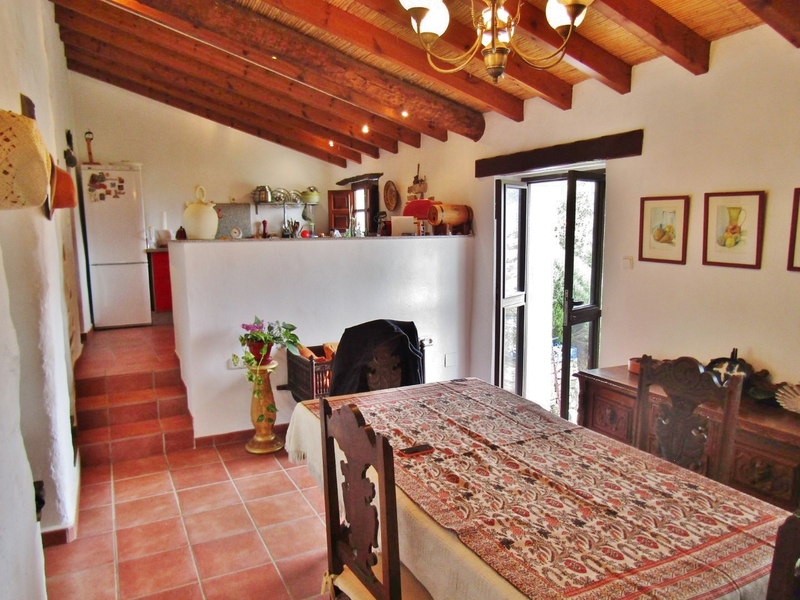 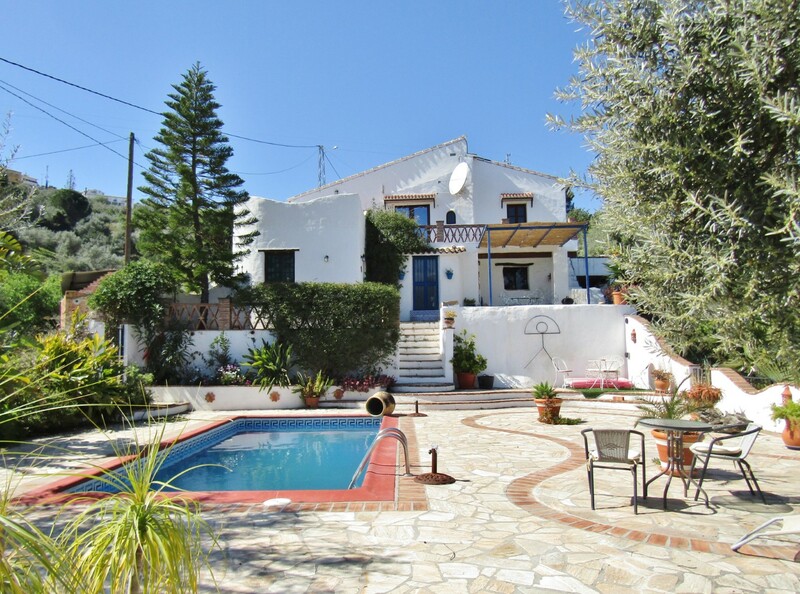 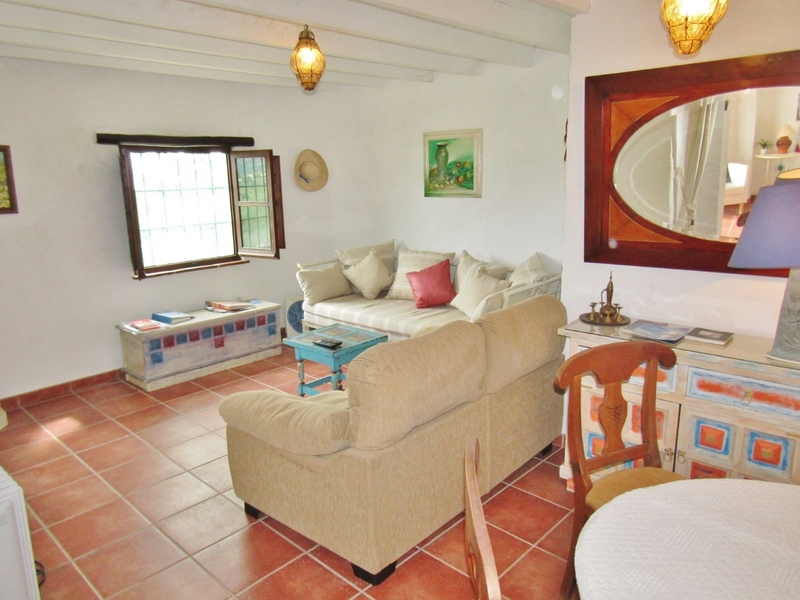 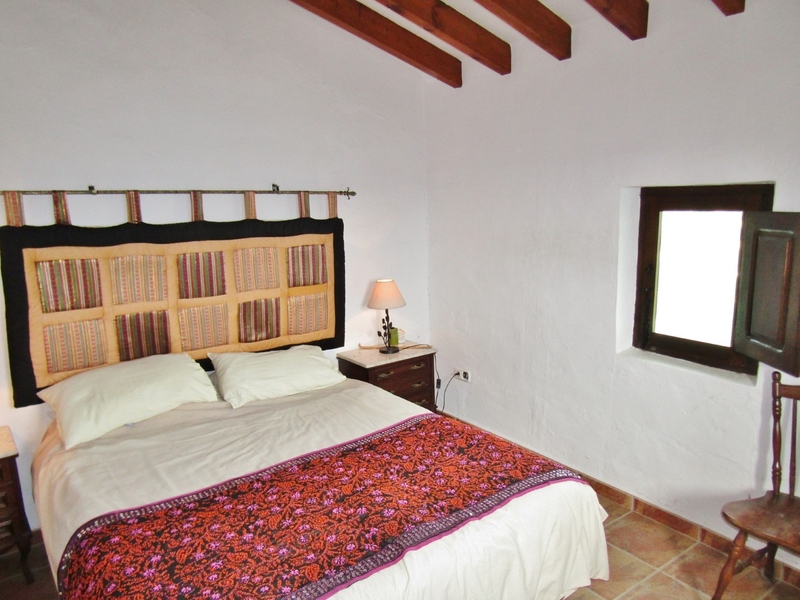 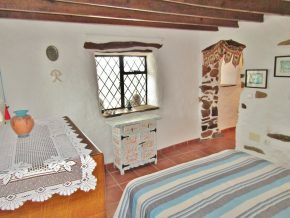 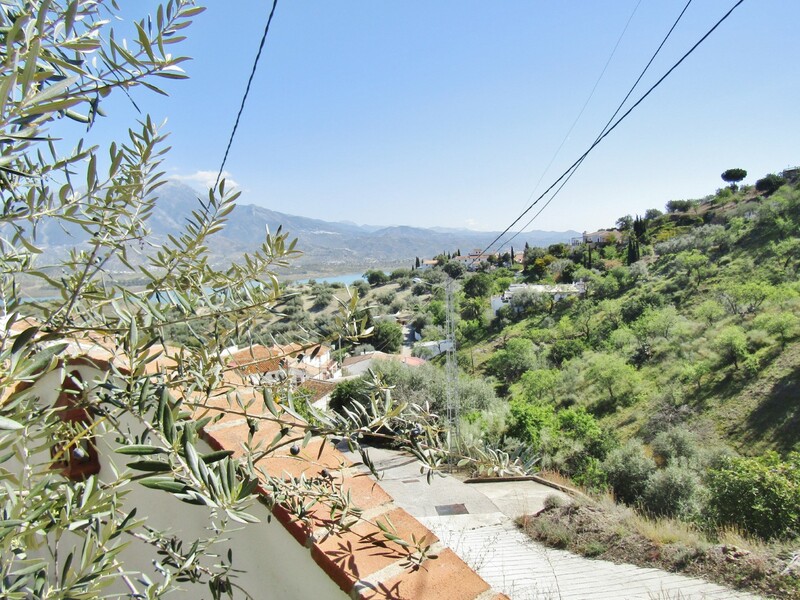 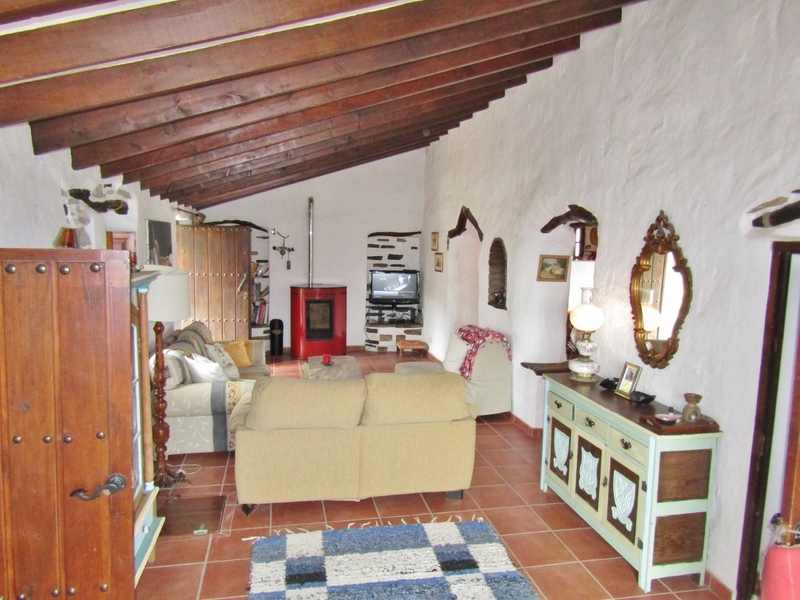 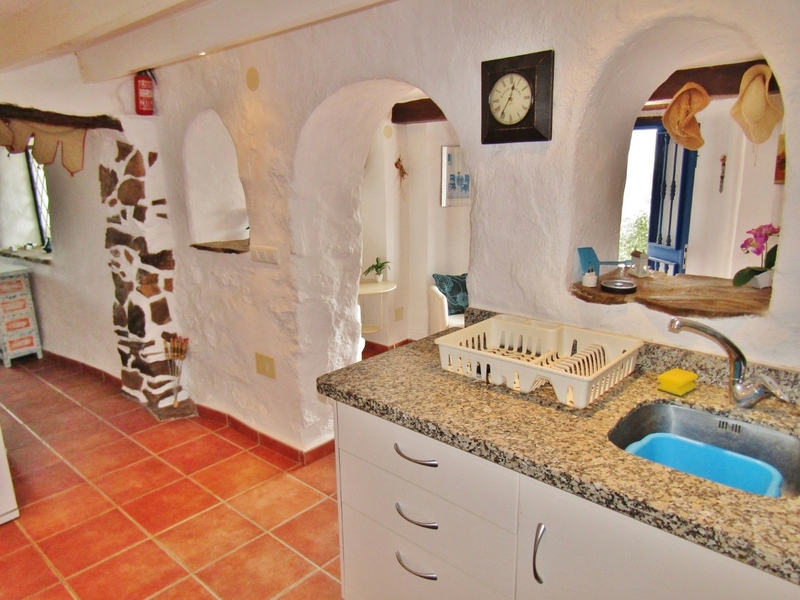 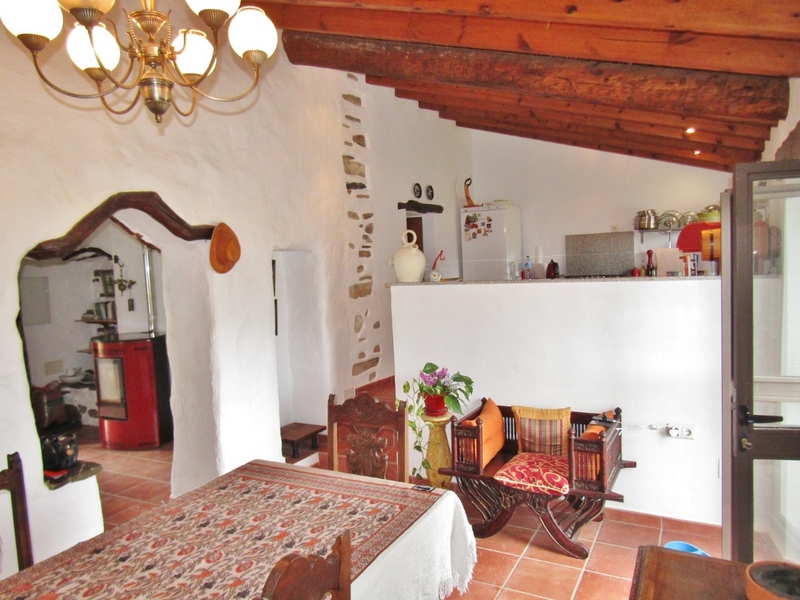 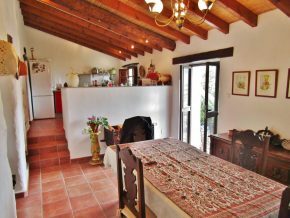 A beautiful, traditional style cortijo packed with original rustic features suche as exposed stone, thick, stone walls, beams, rustic floors, and brick detail, overlooking Lake Viñuela and within a short walk of the village of Los Romanes. 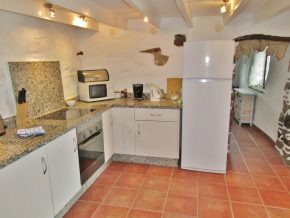 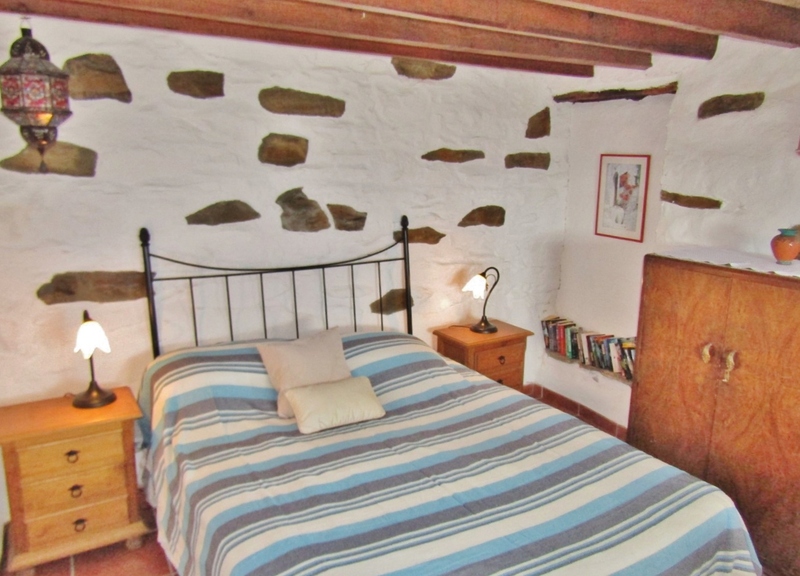 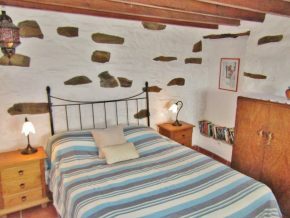 Annexe excellent, registered tourist apartment. 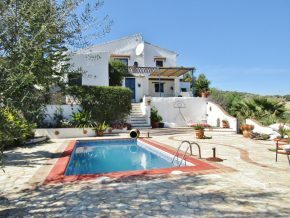 Located along a country lane, just below the picturesque village of Los Romanes, which has 2 shops, several bar/restaurants, a health centre and museum, all only a few minutes’ walk away, this original cortijo offers accommodation in two parts: a stunning, immaculate main hosue, with two bedrooms and one bathroom on a single floor, plus a separate annexe below, with one bedroom and 1 bathroom, level with the pool and lower garden. 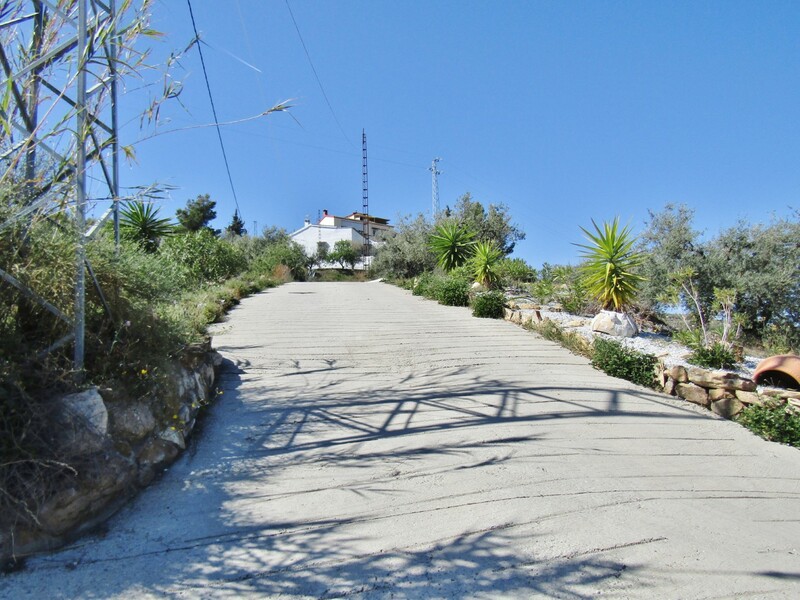 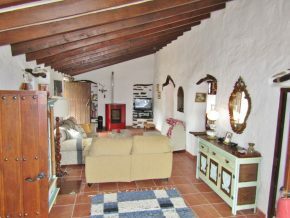 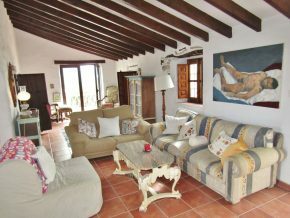 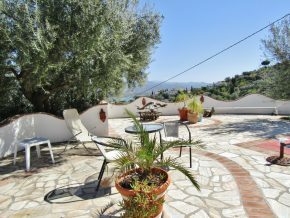 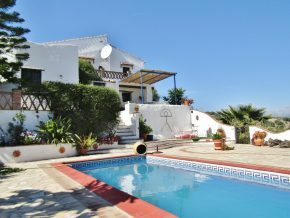 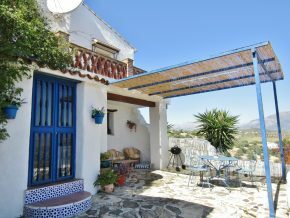 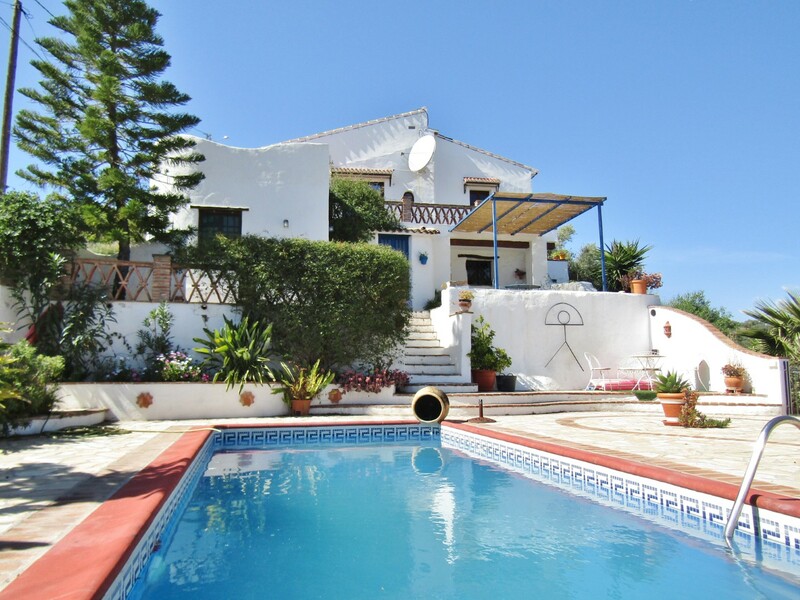 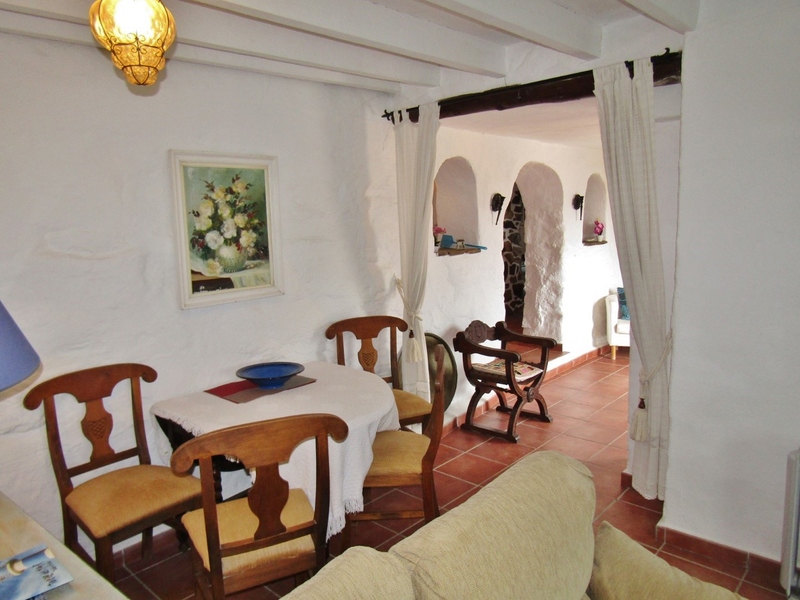 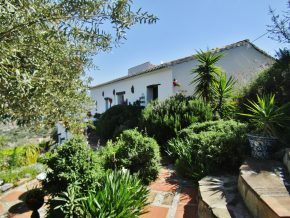 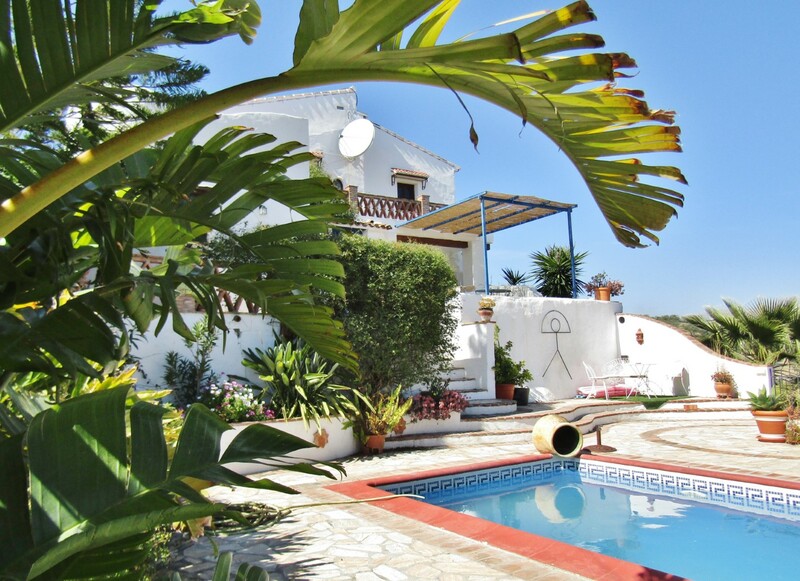 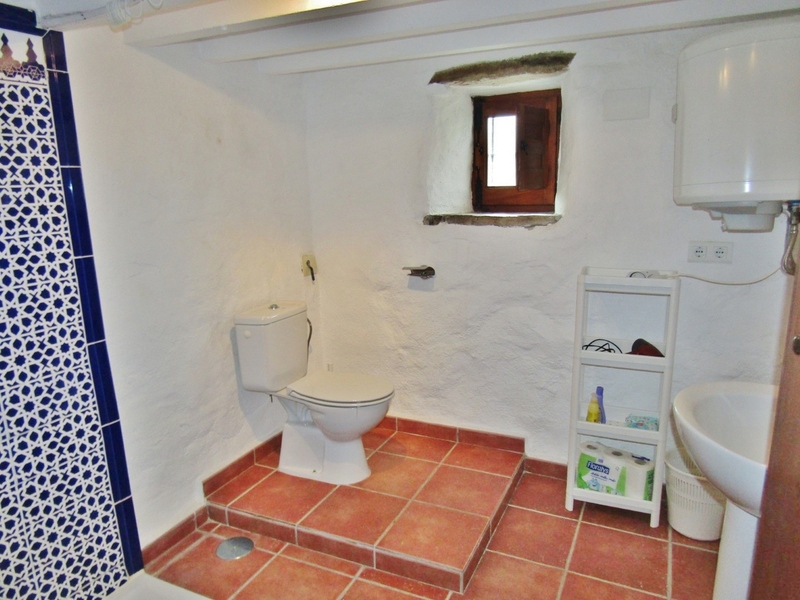 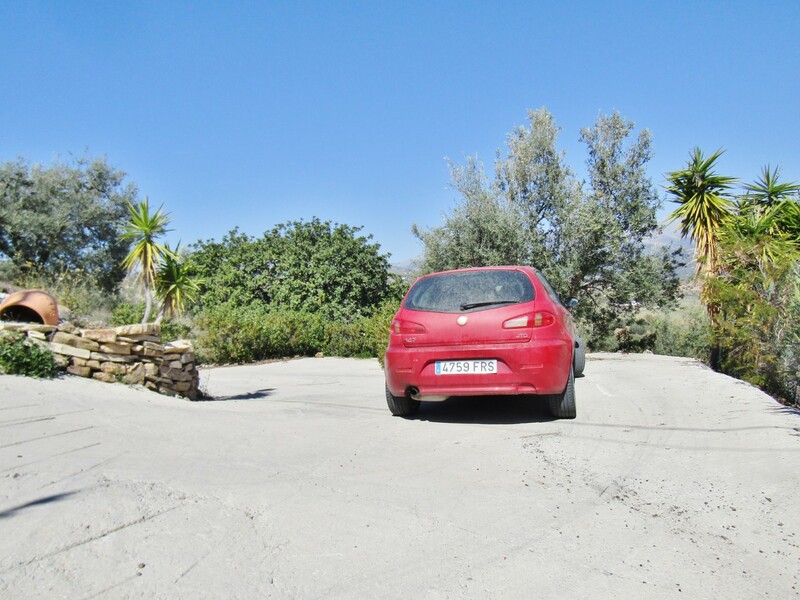 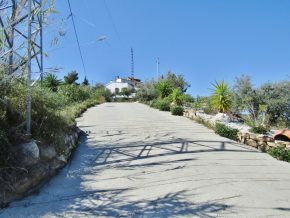 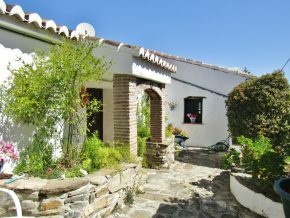 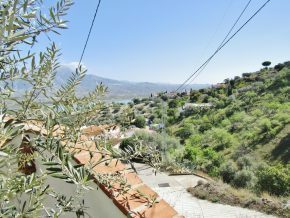 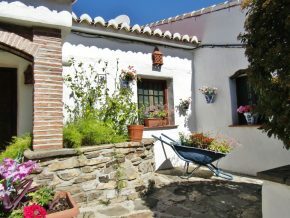 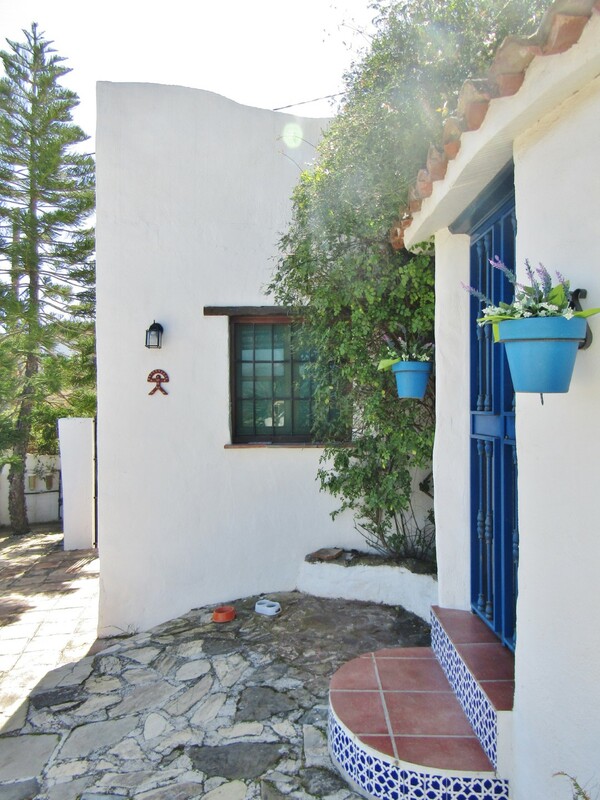 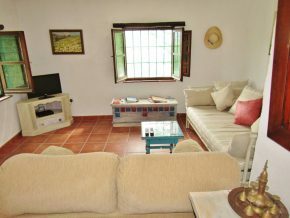 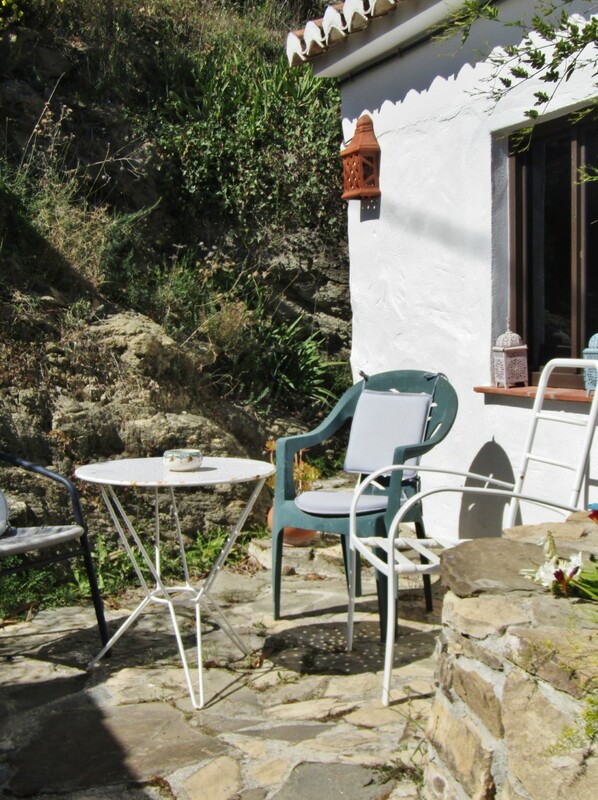 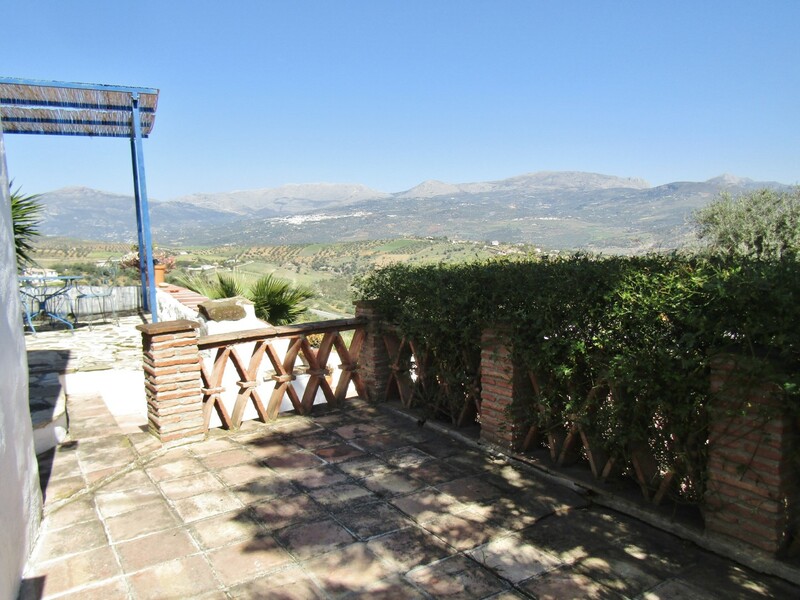 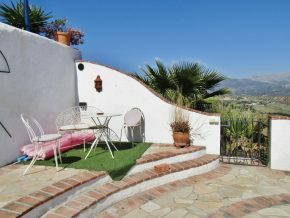 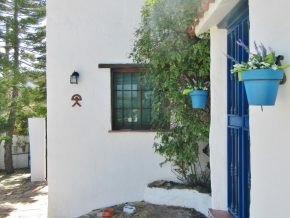 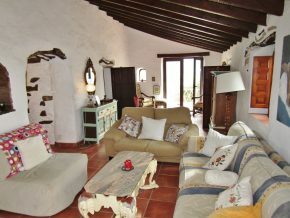 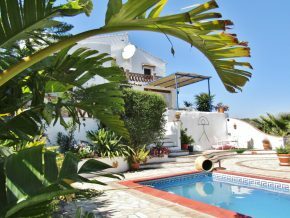 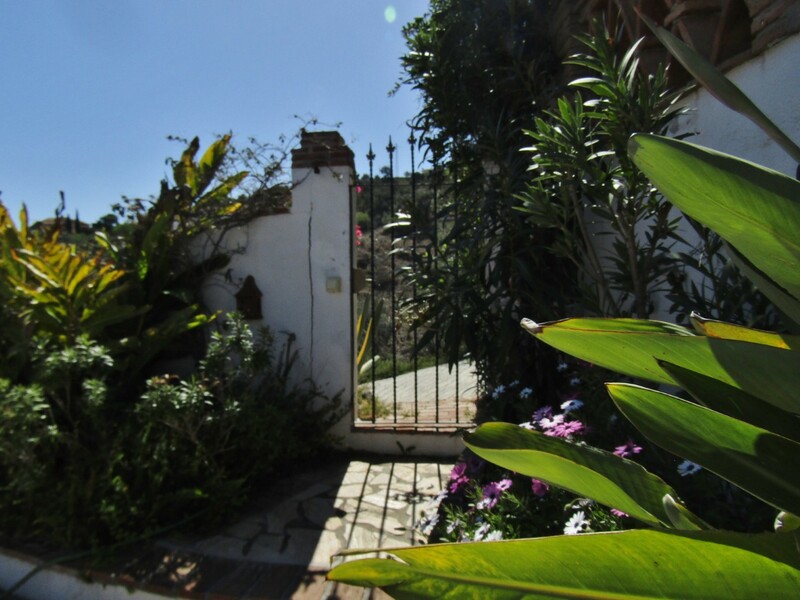 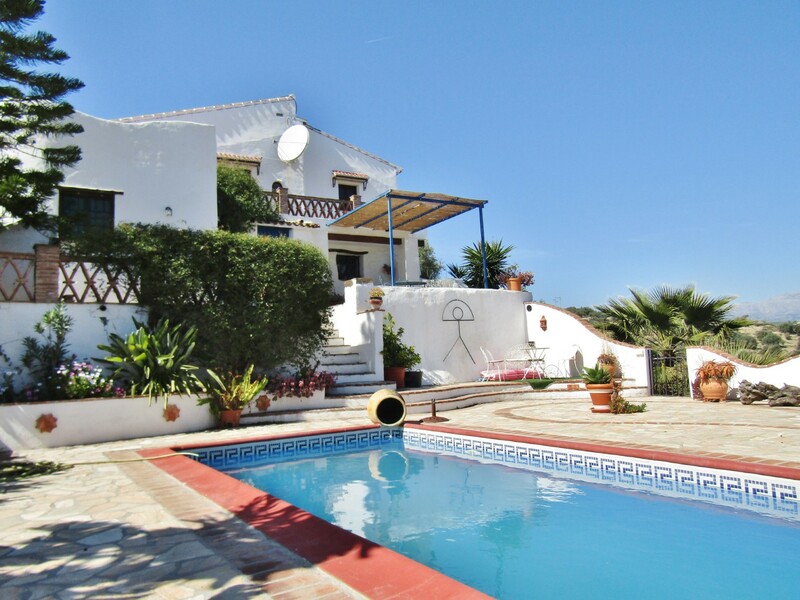 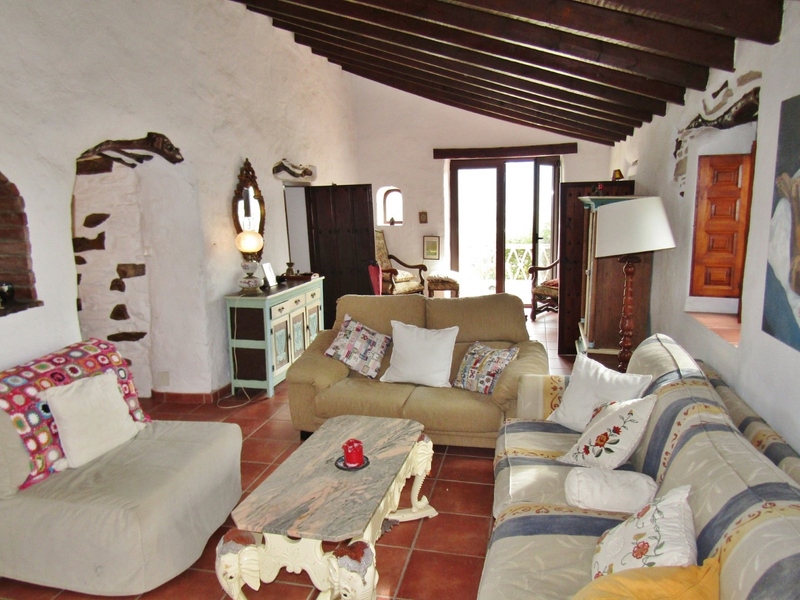 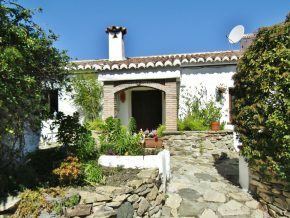 20/25 minutes to the coast at Torre del Mar and 15/20 minutes to the historic town of Velez-Malaga. 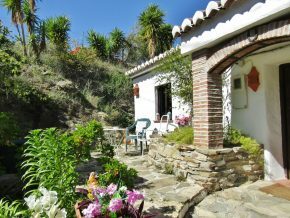 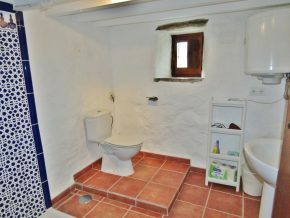 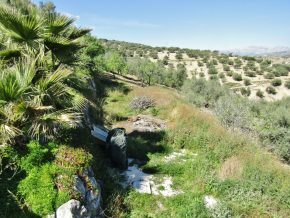 Within one hour of the airport (Malaga). 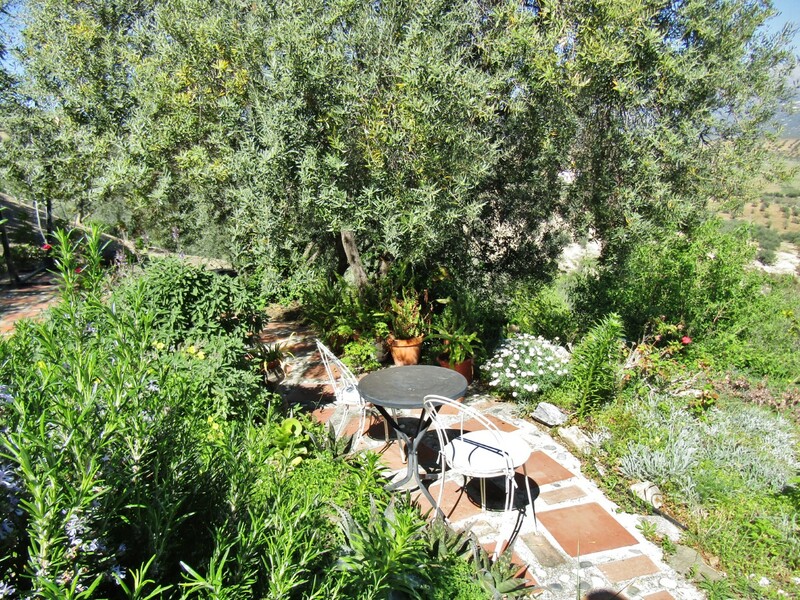 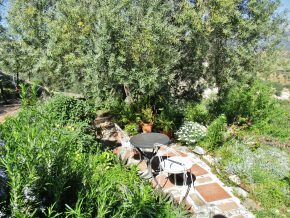 Entrance patio with flowering plants, very pretty area for a cup of morning coffee! Main living room with beams and a pellet burner, leading to a dining room with doors out to the rear patio over beautiful country views, ideal for outside dining. 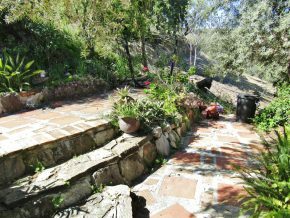 Path to the gardens on this side of the house, and to steps leading to the parking area. 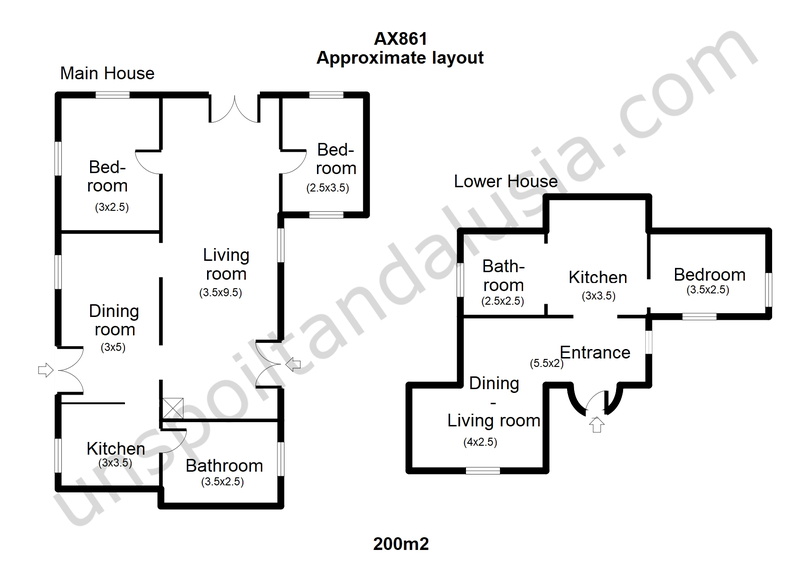 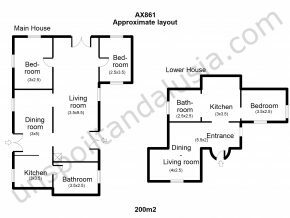 Two beautiful bedrooms at either side of the living room, and a fully fitted, very lovely kitchen, and very large bathroom. 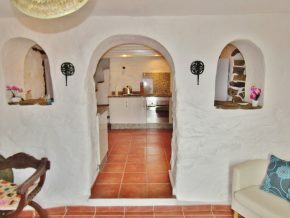 Located through a gate on a lower level, from the road, the path leads to an outside covered terrace with doors into a simply stunning living room and dining room area, with kitchen through a thick archway. 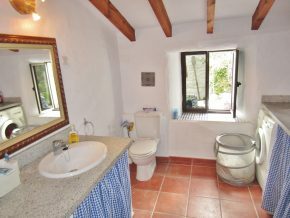 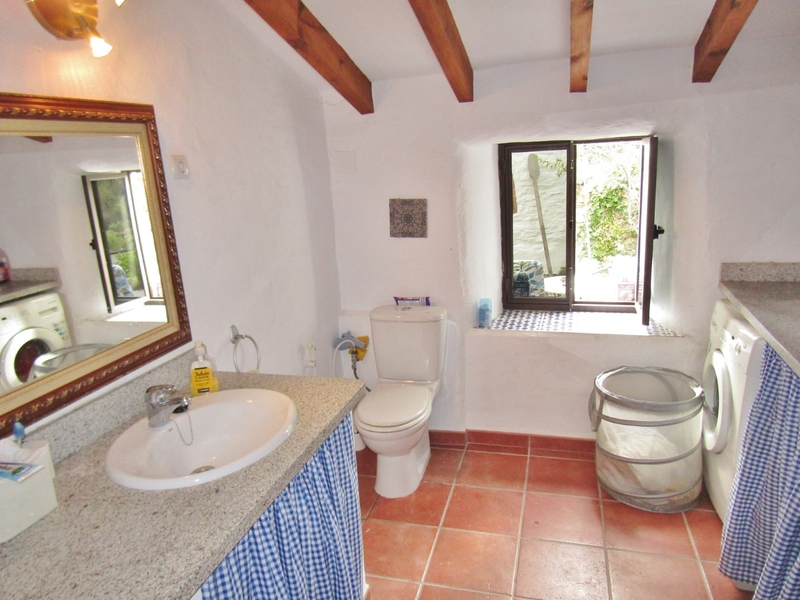 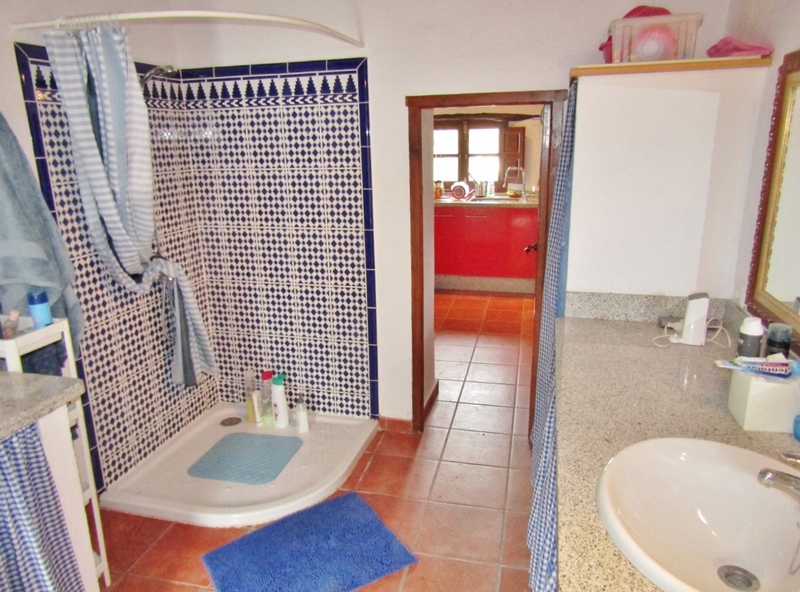 One lovely bedroom and a bathroom on either side of the kitchen area. 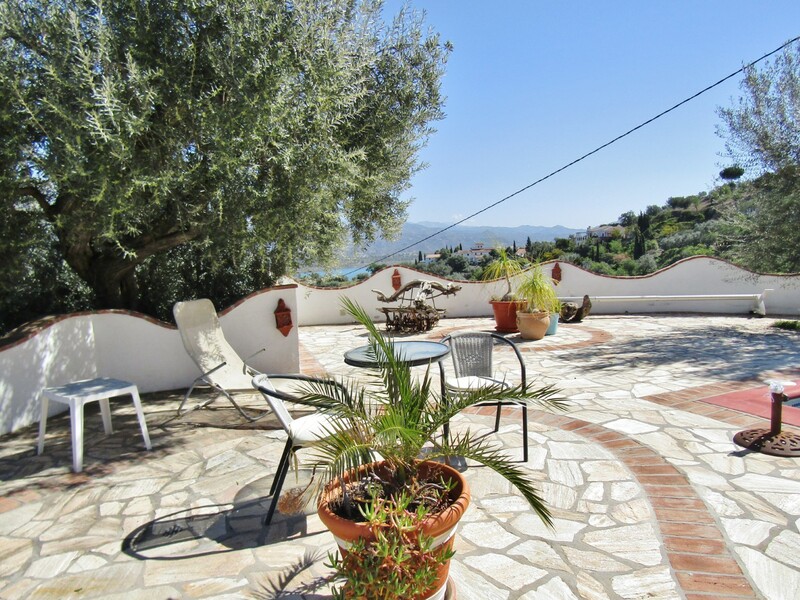 Located on the level of the guest apartment, with panoramic views over the countryside, lake and mountains, making the apartment very attractive to tourism. The pool is 6.5 x 3m with crazy paving sun terraces around it. Just below the pool terrace and accessed via steps is a very good flat area of land, plus the pool room and store. 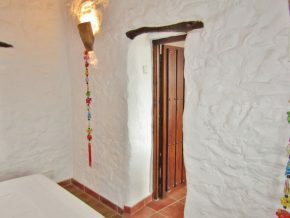 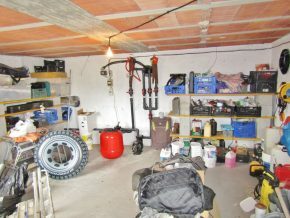 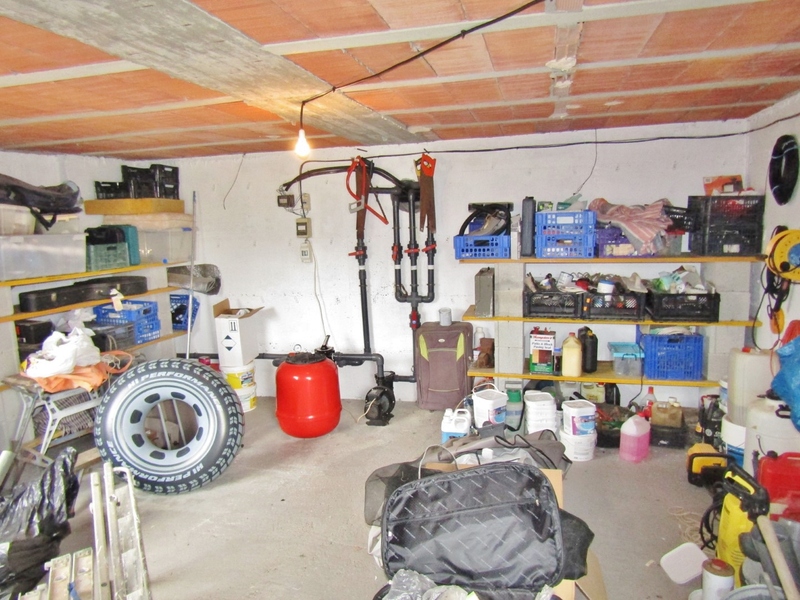 This area might make a perfect vegetable plot or even a location for a ‘yurt’ (the store room could be guest toilet and kitchen facilities for the yurt). 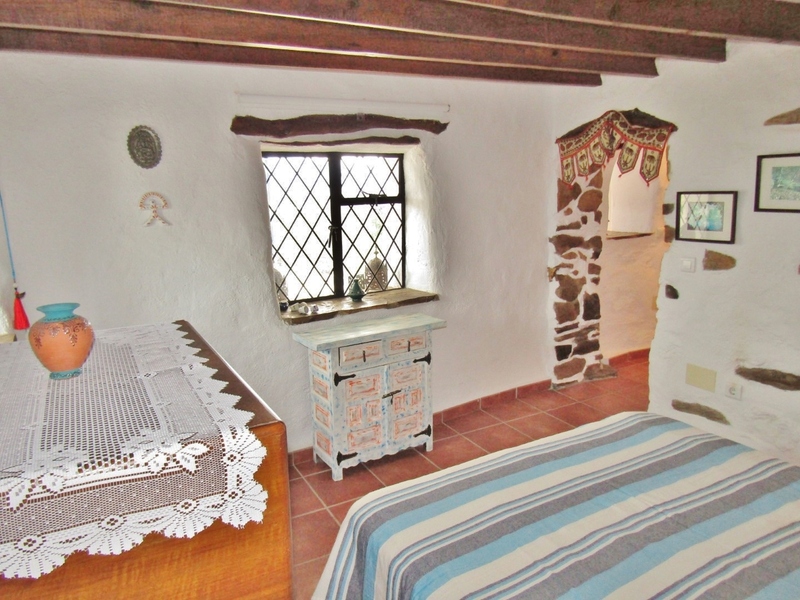 This is a beautifully restored old house, dripping with charm and rustic details with a true ‘wow’ factor that makes it both a stylish home and a good source of an extra income from rental. 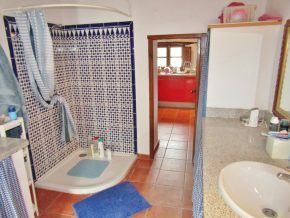 – Council tax (IBI): 420€ p.a.